The Fashion Queen Rihanna rocks black skinny jeans and psuede jacket for her night out in New York City. Fashion doesn't make one stylish until Rihanna decides to put it on her. As a matter of fact, it's no surprise that the Queen of R&B is a fashion Queen too. This lady can make anything look seriously fashionable. Rihanna who's usually seen wearing iconic dresses simply wore skinny jeans and Psuede Jacket the other night in New York. The 30 years old musician still looked stunning as ever. The singer stepped out of her SUV in New York to enjoy her night outing. Even in just skinny jeans and a jacket, the singer looked cool with her casual get up. No wonder she gets called Fashion Killa. Rihanna's bodyguards can be seen around her too. During her outing in New York, the kind-hearted singer even dedicated her time to fans that waited outside in the cold for her. Other than the black skinny jeans and a light brown psuede jacket, Rihanna accompanied her outfits wearing a black turtleneck sweater and a black sock stiletto heels. As a matter of fact, the black stiletto heels that come along with attached socks Rihanna accompanied by her outfits come from fashion house Balenciaga. And in case you didn't know, other fashionable celebrities in Hollywood including Kim Kardashian, Victoria Beckham, Kylie Jenner, Rita Ora carries the iconic Balenciaga heels in their wardrobe too. Furthermore, the Balenciaga heels cost an amount of £935. The Umbrella singer accessorized her casual get up by wearing oversized Fenty shades and a Dior fanny pack worth of $1500. 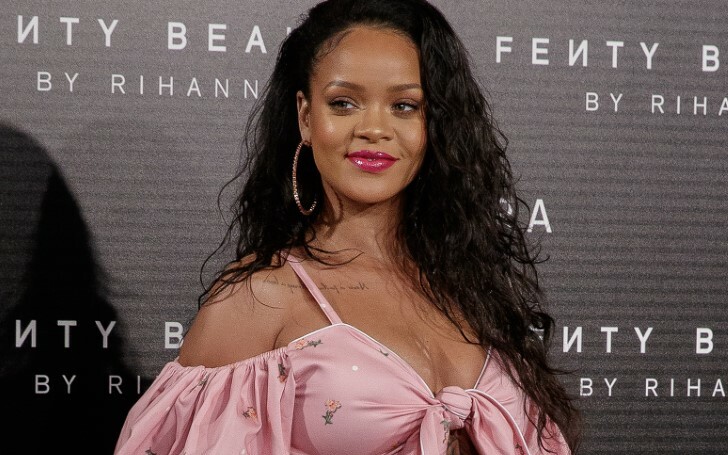 This recent appearance of Rihanna comes after she returned in the US as she recently spent her holiday in Europe with her Saudi Billionaire boyfriend Hassan Jameel. Besides, the singer reportedly filed a lawsuit against her father for using the family name 'Fenty' to promote his business. The singer is rumored to have a rough relationship with her father.